Blind faith is NOT a Digital Marketing Strategy. Do You Know What Your Current Digital Footprint Looks Like? Avoid investing on the wrong areas of digital marketing. The Digital Footprint is the starting line for all things strategy. This is not another generic report. Not another filler information about your industry. Not another benchmark to track. This is a tailored report about YOU. Your business. Your brand. Your Market. Your Competitors. Understand the importance of all of your digital marketing channels and how each of them play an integral part on your user’s conversion. Determine where your previous ads are lacking. Optimise them with the right strategy to create high-converting campaigns and landing pages. Study your competitor’s strengths and weaknesses, strategies to success, and more. This will help you create the ultimate strategy in winning the industry. Discover where your audience are active. This will help you pinpoint where to invest your resources in establishing your engagement with them. Avoid investing on the wrong areas of digital marketing. The Digital Footprint is the starting line for all things strategy.This is not another generic report. Not another filler information about your industry. Not another benchmark to track. Why Is Your Marketing Not Working, but Your Competitors Are Flying? Effective digital marketing does not happen after one quick fix. Quit wasting time and money on run-of-the-mill digital marketing agencies or courses and let’s get straight to the point. The Digital Footprint is a report of your brand’s weaknesses and further opportunities to help you dominate your market and competitors. One Size Never Fits All. Let’s Talk About You. 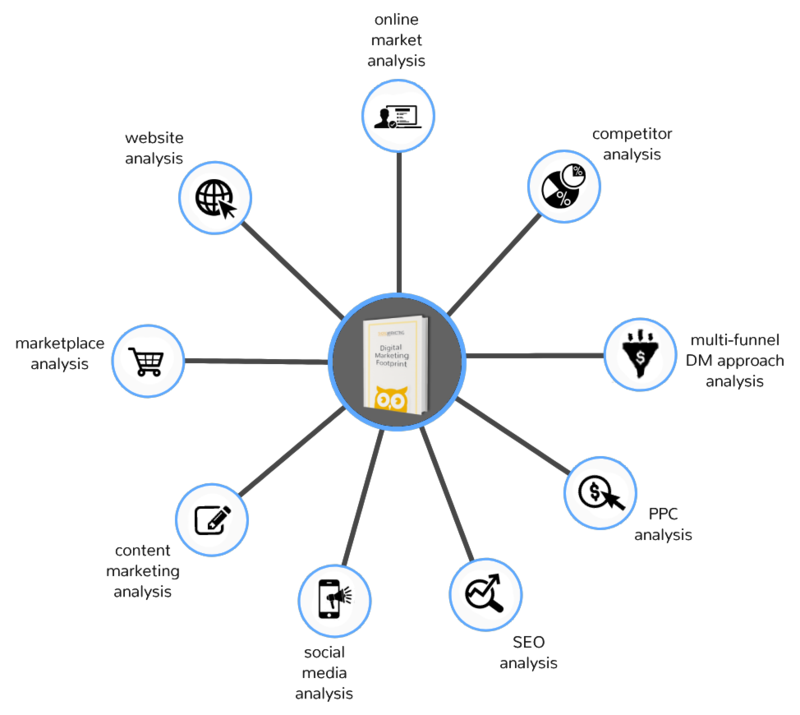 The Digital Footprint consists of five main audit features: Website and Tools, PPC, SEO, Social Media, Content, and Marketplace, if applicable. This means you get to see an all encompassing view of your historical online presence beyond the basic reports of Digital Marketing. Understand how your website’s technicalities (e.g. speed, responsiveness, plug-ins, etc) can affect the performance of your PPC or SEO efforts, or how your online activities can support the offline brand recall, etc. Moreover, the Digital Footprint includes a detailed report of how your elected competitors are performing and on which benchmarks should be prioritised. With our extensive multi-channel digital marketing experience, our experts will personally inspect every element of your online marketing initiatives. This will help us understand the value of each small marketing detail and on how these could affect the bigger funnel of your overall marketing and sales strategies. This is every brand’s must-have guide before creating a campaign or strategy.